High Lifter ATV Outlaw Tire Guide - Best Deals on Best ATV Mud Tires. High Lifter ATV Outlaw Tire Guide. The High Lifter ATV Outlaw tire represents the state of the art among ATV mud tires right now. Before the Outlaw ATV tires came out - your typical ATV mud tire was heavy, rough riding, fast wearing, and didn't hook up in deep ruts very well. Bigger diameter - Improves ground clearance and slows rotational speed for better traction. Lighter weight - Better handling and better throttle response. Uses less power to rotate tire. Deeper lugs that wrapped around the sidewalls - This is what gives the ATV Outlaw tire such good traction in deep ruts. This can can be crucial in maintaining forward momentum when the bottom of ruts don't have much traction. Tougher and more puncture resistant - Hidden debris can ruin a mud ride before it even gets started. Longer wearing - Lug depth is critical for mud traction so the longer you can maintain a decent depth, the more usable life you get from the tire. Better ride and handling - Many specialty mud tires are known for shaking the fillings loose in your teeth!. Others are so heavy they overload the suspension, brakes, and power of the ATV, ruining the ride and handling. Best ATV Outlaw Tire Deals! 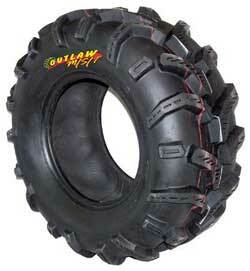 The Outlaw ATV tire is a favorite among ATV mud riders. By most accounts they aced everything on the list with the Outlaw tire. Check out just about any ATV mud tire test, review, or forum conversation, and the Outlaw ATV tires are always rated as one of the best mud tires around. So about all that's left to do is find you the best deal on these things so you can start roostin' your buddies at the mud bog! After all the phone calls, face to faces, and web searches - we came up with the best ATV Outlaw deals we could find. From reliable sources with great customer service! You can thank us when we need a tow out of the swamp. Just click the link above and save some bucks. Also, we set the link up to update so it shows the best deals listed everyday. Outlaw ATV Tires - Specs and Reviews.